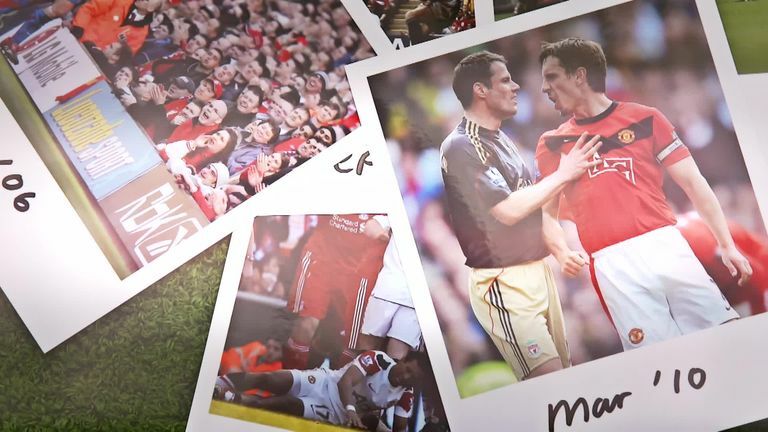 Ahead of Rivalry Weekend, Gary Neville and Jamie Carragher have relived some classic moments and memories from Manchester United v Liverpool. Two giants of English football meet live on Sky Sports Premier League on Saturday lunchtime and both pundits will be part of our team at Old Trafford. NEVILLE: Not getting a red card I imagine! CARRA: Haha. No, not so much the tackle but Wayne Rooney's reaction. I was on favourable terms with the referee Phil Dowd. I got him on my own, pulled him and said 'he just beat me with skills'. Everyone is fighting and I got him over like an experienced pro. Then Rooney comes over and says 'you won't believe it, he's crying'. NEVILLE: Did you seriously go to do him? CARRA: No, what happened was that someone got injured so I went from centre-back to right-back and as soon as that happened, Alex Ferguson put Nani to the left wing straight away. So I'm thinking 'I'm either going to get tight, I'm going to tackle him or I'm going to foul him. There's no way I'm letting him get the ball and run at me'. So I've got there and the ball did jump up at me, I went for it and it just disappeared so I caught him on the shin. NEVILLE: Did you think it was a red card at the time? CARRA: Oh yeah. I've seen the reaction of all the players but like I said, I got Phil Dowd on his own, had a word with him and we came to some sort of a deal. NEVILLE: To be fair, Liverpool had been singing songs about me all game so I thought 'they need to have a bit back don't they?' It was a last-minute goal, unbelievable. I got fined £10,000 for that. NEVILLE: Absolutely, it was worth a 120-match ban! It was probably one of the best moments because we were struggling at the time, we hadn't won the league for three years and it just felt like one of the best moments we had in a couple of years. Every time we scored against Liverpool and it was a winner, and you knew it was a winner, I would celebrate. For me personally, that's what it's about. I think Steven Gerrard has celebrated in front of the United fans a few times, Robbie Fowler definitely did and you've just got to take it on the chin. CARRA: I think this was the first win I had at Old Trafford, or that group of players under Gerard Houllier would have won. NEVILLE: I gave the free-kick away. I think it was the handball into the box. It was shocking. CARRA: I think we went on a run of four or five games after that. It was like that with Manchester United v Liverpool games where someone would win and they would go on a little bit of a spell, but I think for the people in the picture especially - myself, Michael Owen, Danny Murphy, Steven Gerrard - we were young players playing against United, our biggest rivals and going for so long without a win was a massive psychological boost. I think we won three years on the bounce there after that. NEVILLE: That Houllier team were horrible to play against. You used to just play counter-attack, it was a bit like playing Leicester last season, although they were probably better than Leicester, but that was the style of play. A tight back four, tight in midfield and then a counter-attack through Owen. CARRA: I think it's fair to say in that spell we had with the way of playing and the cup final in 2003, we found a way to beat Manchester United. NEVILLE: I've got a picture that I tweeted out a few years ago that says 'welcome to Anfield' as a mock of the sign and it was me taking a throw-in and fans behind me with hand gestures, shall we say, and it's quite a good picture similar to this one. They're not happy, the boys and girls. They've got that look of not really hate, more like they feel sorry for me. CARRA: That's the realisation there, the look on my face and I know it's actually gone in. I think that was Massimo Taibi's first game. I'm trying to change the subject, can we get onto that? We lost 3-2 and that was Houllier's first summer of signing players and there was a lot of pressure on me as he had bought two centre-backs. It felt like it was only a matter of time before I was out of the team and I think I gave him as good of a reason as you can get. NEVILLE: Did he move you to full-back after that? CARRA: Not necessarily straight after that but Stephane Henchoz and Sami Hyypia came in and I basically had to find a new position or probably have to leave and I ended up at right-back or left-back over the next few years. That was the nightmare day. I'm still reminded of it to this day. It was an early game that used to kick off about 11.30 or midday so my dad had probably gone after about 10 minutes and I didn't want to go anywhere local after the game, so I went a bit posh. My dad was in the same pub I went to, he had the same idea to get away from anywhere you know. NEVILLE: Mascherano had pulled down or tripped someone, I can't remember who he tripped, maybe Ronaldo [Editor's note: Mascherano tripped Valencia, with referee Howard Webb awarding a penalty to United. Rooney scored from the rebound after Reina saved his spot-kick]. CARRA: He hadn't been sent off yet and you were in the middle trying to get him sent off. CARRA: I was trying to stop him getting to the referee because I knew what was coming. NEVILLE: Part of the big games is influencing the referee. You had to. Arsenal did it, Liverpool did it, we did it. Other clubs like Chelsea did it and I genuinely believe you could influence them. Not in a way that makes them a cheat or dishonest, no, but just that the pressure of being in Anfield or Old Trafford with that weight, it's not easy. It can't be easy to cope for one man to think they don't know who is telling them the truth. He's saying one thing, I'm saying exactly the opposite, the fans are saying something different, the managers are all up there and he's got to keep cold and make a decision and you're trying to influence that. It wasn't a massive part of the game, but it was part of the game that was there and this incident was over influencing the referee. CARRA: My first reaction was to push Mascherano because he pulled someone's shirt back, and they came at an angle and there was no need to pull the shirt. He didn't have to do what he did. NEVILLE: It wasn't a red but it was a red. When Mascherano played for Liverpool, would you think he would've gone on to do what he did for Barcelona? CARRA: No I wouldn't. I always thought he was a top player, but not a Barcelona type of player. To be honest, when he went there, he wasn't quick enough with the ball to move it so I think they've actually reinvented him at centre-back. NEVILLE: That was a pretty regular happening in Liverpool v United games, players moving each other away from the referee.